Today, saws are sharpened only rarely and by few woodworkers, but the question still tends to arise of how to do it. Like so much of the handyman's knowledge, sharpening is becoming a forgotten craft. To be able to sharpen one's own most vital saw, and to know that one is not simply relying on buying replacements, brings about a real gain in skill and self-confidence to any woodworker. The ability to maintain the sharpness on one’s saw blade allowed saws to retain their usefulness, no matter how long the resided in the woodworker’s toolbox. Today's mass produced, plastic handled and Teflon-coated disposable saws are a poor comparison to the quality saw of old; they never inspire any loyalty, for they are designed to be simply thrown away as soon as they get blunt. Which saws can be sharpened? Basically, any saw that has not got special hardened teeth can be sharpened. Saws with hardened teeth - which means the majority of saws sold today - cannot be sharpened in the normal sense of the word. Hardened teeth have exactly the same hardness as the sawfile, which thus can have no effect on them, so you only can use diamond files! Many manufacturers only harden the tips of the teeth, which has the advantage that they later break off less easily, but the disadvantage that once the topmost layer has been worn away the soft metal below is exposed. You need only a few tools: a flat file, a saw vise or alternatively two boards with clamps, a saw file and a saw set. What are the stages of the work? Repeated sharpening will alter the shape and height of the teeth. The row of the teeth, which originally stood as a neat rank becomes ragged, the teeth that have been shortened are not up to the mark and are no longer doing any of the sawing - the cutting performance tails off. Trimming will make the saw's teeth usable again. To do so, one fixes the saw in the saw vise and files back and forth over the row of the teeth with a flat file until a top surface has been produced on the point of every tooth. The odd extremely short tooth can be excepted. A versatile guide for the file is the jointer and edger made by Veritas. If this is what your saw blade looks like, it needs trimmimg! This is what your saw blade will look like when it has been trimmed. The saw blade is now treated to even filing with a 3-sided file, so that each tooth without exception receives 3 or 4 strokes of the file overall. The process is repeated until all the teeth are the same shape and the base of the teeth is in a neat line. A crosscut saw blade after the teeth have been reshaped. Setting a saw means bending alternate teeth outwards to either side, making the cut wider than the blade, so that the latter does not jam. The offset must be absolutely equal to both sides, or else the saw will go off course in the direction of the wider offset side. For this job you need a saw set. To avoid tooth breakage, never bend a tooth to the right that was previously bent to the left, and vice versa. The total width of the offset should be less than double the width of the blade; good crosscut saws are already set by the manufacturer to no more than 1.4 or 1.6 times the thickness of the blade. If you offset to more than double the blade's thickness, the wood in the centre of the cut will not be properly contacted and the saw will not work smoothly. Dry wood needs less offset, wet wood more. The depth of the offset is also important. It should on no account be for more than half the height of the teeth; a third is preferable. If it is too deep, cracks may appear at the base of the teeth and the saw will then bow. The handset will give you the ideal offset. Place the handset on the teeth at one end of the blade in such a way that the stamps points to the first tooth, and press the grip together. By being pressed against the anvil by the stamp, the tooth is set. Do this to every second tooth the length of the blade, then turn the blade round and give the remaining teeth the same treatment in the opposite direction. Sharpening should take place after the setting, to avoid the tool damaging the teeth. A three-square saw file is required for the task. First the sawblade must be clamped in the saw vise right up close to the base of the teeth, to avoid vibration. The file should just be able to pass above the jaws. 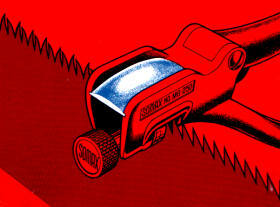 It is guided horizontally through the gap between the teeth, at right angles to the blade when sharpening a rip cut saw. When sharpening a cross cut saw, the file must be guided horizontally at a 60 ° angle. The back and front of two teeth should be filed at once, lifting the file slightly as it returns. The cross-section of sawrfiles is an equilateral triangle, and the 60 ° corner is the wedge-shaped angle between the teeth. The edges of the sawfile are slightly rounded to enable the base of the teeth to take a slight curve. This prevents crackings in the blade. Teeth of a rip saw after they have been correctly set and sharpened. Teeth of a crosscut saw after they have been correctly set and sharpened.